In a small, microwave-safe bowl, whisk milk and egg yolk together and microwave 30 seconds. Set aside. In a large bowl or bowl of a stand mixer, whisk together flour, sugar and yeast. Add milk mixture, butter and salt and stir to combine. Using dough hook and stand mixer or by hand on a lightly floured surface, knead dough until it comes together and is smooth and elastic, about 5 minutes with stand mixer and 10 minutes by hand. Divide dough into two pieces, then divide one piece equally in half and the other so that one half is twice as large. Add green food coloring to the largest piece and orange and black food coloring, respectively, to the two medium-size pieces (leave the smallest piece white). 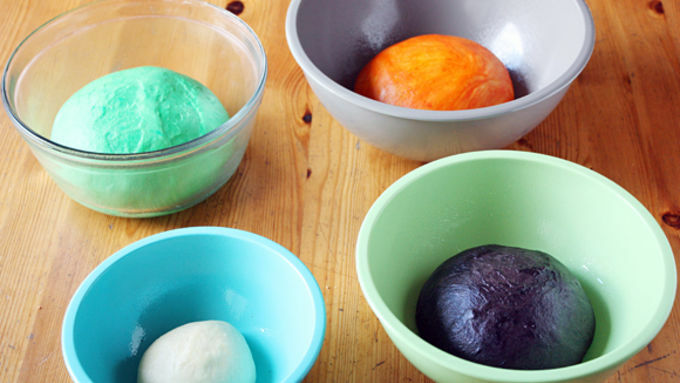 Knead in food coloring either by hand or in a stand mixer (clean out bowl between colors). Place dough pieces in four separate lightly greased bowls, cover with plastic wrap and let rise until doubled, about 1 1/2 to 2 hours. Punch down risen dough and turn out onto a lightly floured surface. Take a large piece of the green dough and form the base of the bread -- approximately a 7-by-2-inch rectangle. 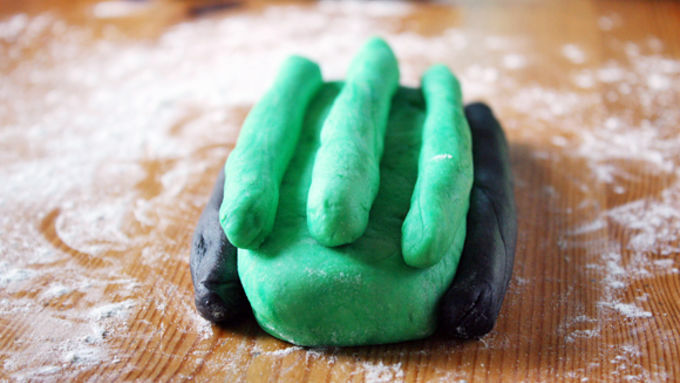 Top rectangle with 3 thin ropes of green dough, using a dab of water on your finger to help dough adhere if needed. Take about a quarter of the black dough and divide it into two thin 7-inch long ropes; place each rope along either side of green rectangle to form the bolts. Use water on your finger to help dough adhere if needed. Divide white dough in half and roll out into two rectangles about 7 inches long and 4 inches wide. Take a small piece of black dough and divide into two pieces; roll each piece into a 7-inch log. Place one black log in the center of each white rectangle lengthwise; roll up white dough around black dough to form a log, or the eyes. 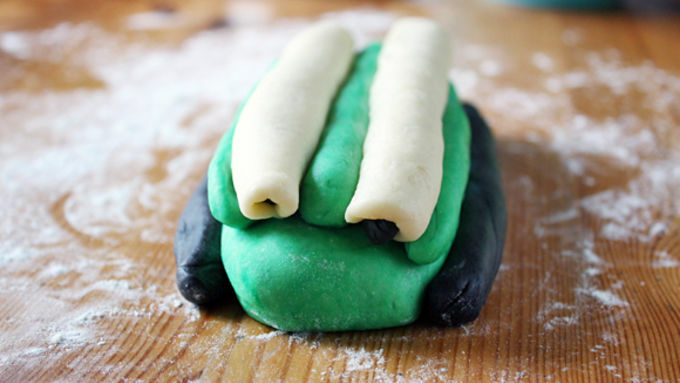 Place eyes in between logs of green dough, using water to adhere if needed. 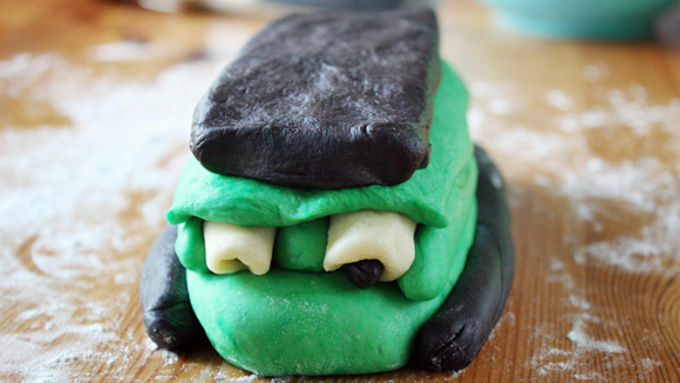 Top eyes with remaining piece of green dough shaped into a thin rectangle. 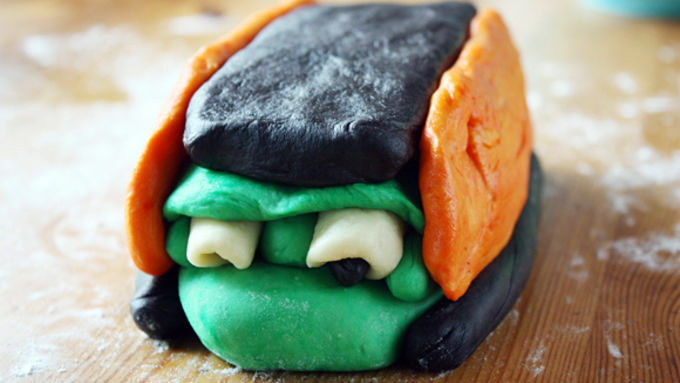 Shape remaining black dough into a rectangle and place on top of green rectangle to form the hair. Divide orange dough in half, then divide one half into two pieces and set other half aside. Roll out remaining pieces into 7-by-4-inch rectangles and place rectangles on either side of Frankenstein face. 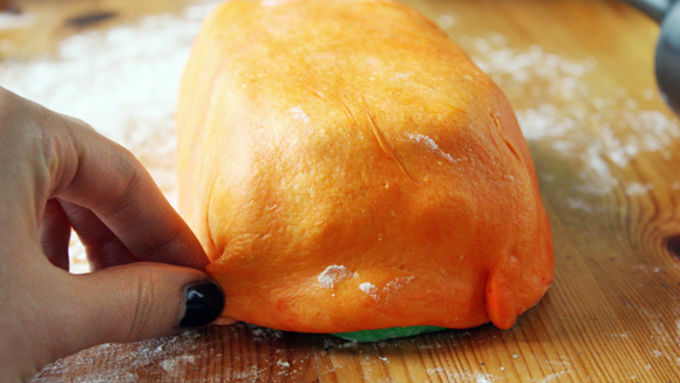 Use remaining orange dough to roll out into a thin rectangle that will completely cover entire dough, including edges, using water to adhere if necessary. 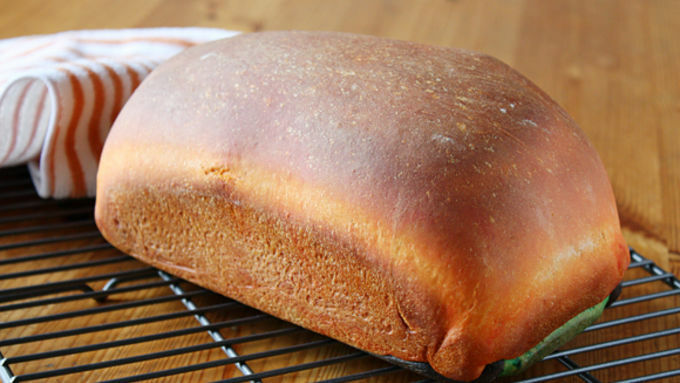 Place entire dough in a lightly greased 9-by-5-inch loaf pan. Cover with lightly greased plastic wrap or a tea towel and let rise until doubled, about 1 to 1 1/2 hours. Meanwhile, preheat oven to 375°F. When dough is risen, uncover and bake 30 minutes or until golden brown and a thermometer inserted in the bottom center registers 190°F. Remove dough from oven and loaf pan and allow to cool completely on cooling rack before slicing to reveal your creation. This bread – let’s call it Monster Bread, though it went horribly, horribly wrong, like a bad laboratory experiment – is what I shall hereafter call a Major Fail. 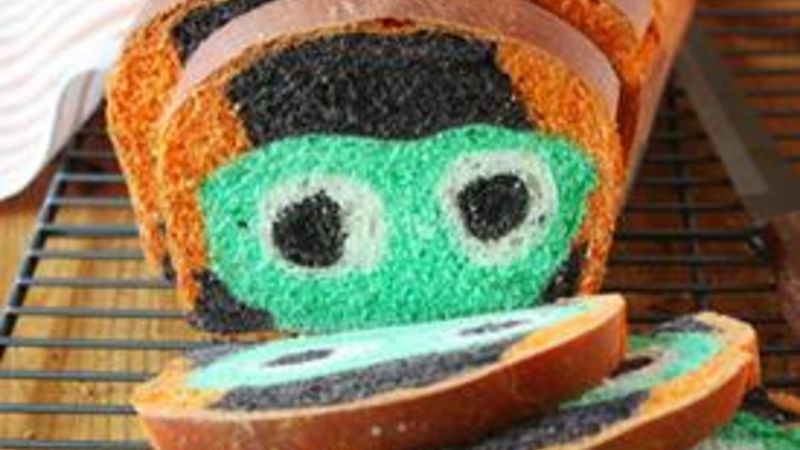 Before you shriek in terror at the hideousness that is this bread’s reveal, let me tell you a little story about That One Time I Tried to Make a Bread With Frankenstein’s Face In It and Failed Miserably. Settle down, my friends – this is about to get reaalllll goooooood. Little did I know that I was about to embark on a serious baking catastrophe, the likes of which had not yet been seen in my kitchen (OK… that’s a lie. I have also had boiling butter explode in my face and batter leak out of the baking pan into the bottom of my oven. Ah, memories.). But what is an experienced food blogger without a few failures to share, amiright?? I’m just going to go cry into my pillow now. ANYWAY, as I was saying, I knew the drill – make the dough, divide the dough into a few pieces, color each piece of dough, yada yada yada – and then the sky went dark and lightning flashed and all of a sudden I was wearing a lab coat and goggles and my hair stood on end as I cackled into the storm… but I thought nothing of it. These things happen. So I moved on. Then, I baked it up. And let it cool (by far the most grueling part of the whole process – WHAT IS GOING ON IN THERE? WHAT DOES IT LOOK LIKE? I MUST KNOW!!!). And then came the reveal – dun dun dun (you obviously know where this is going). THIS. This sort of alien, sort of flying saucer with eyes and an afro, sort of Frankenstein-like face if you squint real hard and try to not hurt my feelings. My glorious creation was… well, not so glorious. It was the opposite of glorious. It was hideous. (OK, but kind of cute, too, right? In a weird unidentifiable face-bread-object sort of way.) What went wrong, you ask? I still don’t really know myself. I mean, it’s not every day you try to shape dough into a face, so the task itself isn’t the easiest. On top of that, you’re trying to put bolts, eyes, hair and all the fixins of a Frankenstein into a malleable bread – and sometimes, specifically this time, it’s a recipe for disaster. So the moral of the story is this: Sometimes, a face is not meant to be a bread. Or a bread is not meant to be a face. Or… whatever. Or maybe it is, and I simply have yet to find the perfect recipe that will yield a Frankenstein face. But it is a lesson learned – and a legend that will go down in history forever as The Frankenstein Face Bread That Wasn’t. A.K.A., Major Fail. But one that was still super tasty, if I do say so myself. Hey, at least I didn’t try to burn my face off with butter again! There’s always a silver lining.